“Experiencing the spectrum of “outsider” status relative to Silicon Valley has been life changing.” Five Questions With Spotify’s Product Leader Shiva Rajaraman. I had the good fortune of meeting Shiva on his first day at Google in September 2006. He’s an excellent product leader and someone I relied upon to help lead YouTube’s efforts AND personally learned a great deal from. Shiva’s over in Europe helming a number of product initiatives at Spotify. Hunter Walk: You’re an expat, having moved to Sweden last year for a leadership role at Spotify. At a personal level, what has that been like? From a professional standpoint, should more folks in the tech industry consider a year or two abroad? 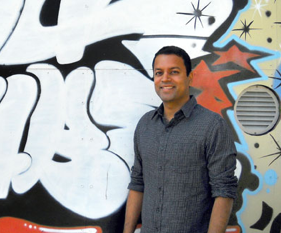 Shiva Rajaraman: A big part of my decision to join Spotify was to experience firsthand the culturally diverse and dense scene Europe represented. Keep in mind that I grew up in Texas and then lived in California. While “traveling” did indeed involve planes, for the most part, I would take off and land in the same state. Subsequently, cultural diversity was largely about how authentic the TexMex was or the quality of burrito options. Living in Europe with easy access to different countries, divergent points of view, and experiencing the spectrum of “outsider” status relative to Silicon Valley has been life changing and a career choice I would recommend to everyone even if only for a couple of years. Small perspective shifts make an impact. For example, the hippest hottest app or service rarely launches first in Sweden (unless it was born here) and often those apps are dead before they achieve a large user base in Europe. That shapes how you think about impact. I rarely look at any key metric anymore that isn’t simultaneously plotted on a map of the world. The global mean is so misleading. HW: Previously at YouTube and now at Spotify you’ve held significant product responsibilities in areas where software and content engineering are blurring. How does this affect the PM role? What advice would you give to young, aspiring product managers? SR: At both Spotify and YouTube a large part of the product is in fact the content. As a PM, your role can be summarized as creating experiences that connect people with the perfect content for a given context. As you do that, it’s increasingly important not to take the content for granted – you can hack that too 🙂 Accordingly, PMs need to be great at marketing and merchandising content as well as understanding the creative process and business models behind that content to look for opportunities to innovate. A great PM of the future is mixing great product design instincts, algorithmic chops, marketing tropes, and ultimately is looking to be a pioneer of new ecosystems. For example, at Spotify we have a new experience, Spotify Running, where you first set your pace and the music adapts to your pace using existing music as well as new originals created specifically for this context. Those new originals are produced at various beats per minute so they can fluidly adapt to different paces – you can increase your pace and the track morphs to the new one without you losing your vibe. That represents a whole new format for creators and perhaps it’s the birth of a whole new economy for musicians who can best serve this new demand via a novel format. I believe this applies to many of us in technology today – just making things accessible on a smartphone is not enough. We are moving from access to executing on alternate realities at every level of the stack. HW: When we worked together at YouTube you were well-known for your ability to get disparate groups to collaborate or help “sell” an idea across the org. Shiva’s Jedi Mind Tricks, I think was what it was called. What’s the secret sauce here and why do you value agreement versus “my way or the highway” management styles? SR: Great ideas come from unexpected places. If everyone has the full context on your mission, you are going to channel more people’s ideas and get a much more creative result. In addition to context, most people channel their creativity and energy to teams they love – so relationships matter. These are the are the reasons I’ve invested so much in building relationships across the org and empowering those in different functions. Now, at times, and where I’m learning to be a stronger leader, is that you can hypnotize people with cryptic but infectious storytelling. That’s where the “jedi” reputation comes from and it’s honestly not necessarily a good thing. Especially in my new home base where English is a second language for many and my metaphors and jokes might fall painfully flat, I’m learning to be more plain spoken. It’s a journey. Apparently there is a glossary floating around at Spotify with my name on it. HW: The music industry, specifically the labels, are perceived by the tech industry to be difficult partners. And I think the labels would probably say the same thing about the tech industry. Why has there been conflict and can you point to examples at YouTube or Spotify where incentives are actually aligned? SR: Our incentives are fully aligned when it comes to creating more opportunities for creative talent to connect to audiences especially in a world where how and where people connect is changing so rapidly. I believe a lot of this potential is grounded in the changing technological landscape: new contexts that previously could not be served might be reachable only now thanks to the fact that you have the world in your pocket at all times. And with Internet-enabled devices and access proliferating, the idea of being able to “sign in” anywhere is imminent. At Spotify that means we can enrich every moment of your day with music – your commute, work, workout, party, and even sleep. That ultimately means we are making music essential to more moments in people’s lives and that represents a bigger audience and thus business opportunity for everyone in the industry. For creators, I’m hopeful that this evolution catalyzes a range of new formats but also creates brand new business opportunities if not whole new economies. In my opinion, media is still far from its full potential. HW: Since you’re at Spotify, what’s on your playlist? SR: Hip hop! Lately, I’ve been waxing nostalgic probably because of the move away from Cali and I’ve been on a throwback kick to A Tribe Called Quest, Nas and now that it’s dark Home Sweet Home by Substantial always brings the light. That said, there is a vampire side to me and so I’m trying to embrace sunset at 2pm with a more sober vibe. Like this track from Flying Lotus and Jane’s Addiction all in.